*** Accessorize, Accessorize -- it makes the Soul feel Good when You look Good! Shop Handmade / Handcrafted Jewelry . Average Prices between $15-$30. Browse Numbered Photos. MORE Photos listed at INDEX /BLOG Archive at Right. (Click on MONTH or YEAR to view more) Questions? Blog in Comments Area (listed at the bottom Right of each Section) OR Email me: jLiz4U@yahoo.com **Jewelry Pieces/photos added frequently (1000+ Items so far). 1331,1332. jLiz4U Jewelry . 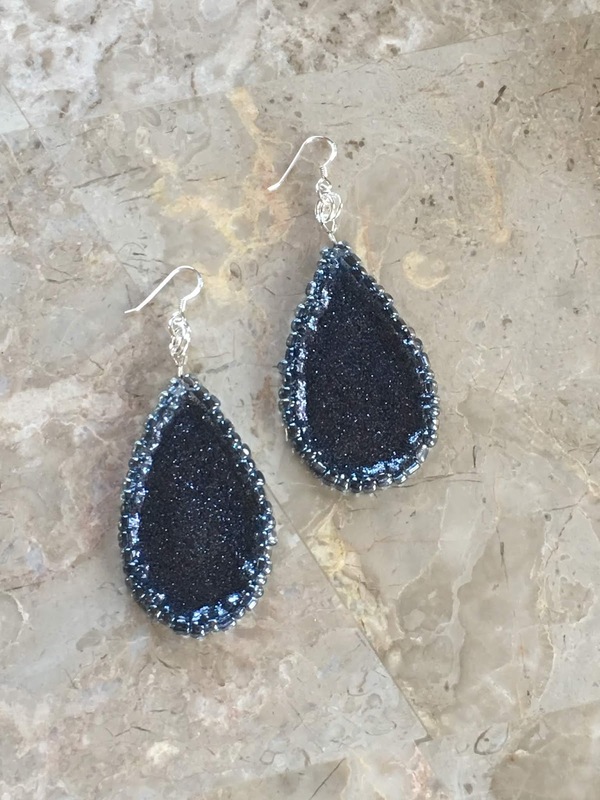 Glitter, Resin beaded Teardrop Earrings: Glitter & Resin Earrings with beaded outline and Sterling Silver Earwires, silver plated links. 1326-1330. jLiz4U Jewelry . Rings of different Styles and sizes -- finger ring or toe ring sizes, Sterling and plated Or Copper and Brass, some with Cubic Zirconias as well. 1326. jLiz4U Jewelry . Sterling small size Rings , antiqued designs with Lizard shape in Center. 1327. jLiz4U Jewelry . Silver Plated designs with Cubic Zirconia accents. 1328. jLiz4U Jewelry . Silver plated copper Fish design etching. 1329. jLiz4U Jewelry. Copper with Brass detailing rings. 1330. jLiz4U Jewelry. Copper with Brass detailing Rings. 1323. jLiz4U Jewelry . Tassel Necklaces : Long Necklaces in Silver , Pewter and Gunmetal with Crystal tassels. 1324. jLiz4U Jewelry . Sterling Earwires and Silver plated, Pewter and Gunmetal Links. 1325. jLiz4U Jewelry . Sterling Earwires and Silver plated antiqued detailed Tree Charms. 1321-1322. jLiz4U Jewelry . Swarovski Urban Rectangle Crystals: Sterling Leaverback and Fishook Earwires, silver plated links. 1321. jLiz4U Jewelry. Swarovski Rectangle Urban Crystals AB large crystals and Urban Silver Night medium crystals. 1322. jLiz4U Jewelry. Swarovski Rectangle Urban Bermuda Blue Crystals in Medium and Large. 1319-1320. jLiz4U Jewelry . Swarovski Crystal Earrings: Swarovski Crystal Rivolis and Crystal Cushions, on Stainless posts/ Silver Plated Fishhooks/Sterling Earwires/ 14KGold-filled Earwires, Settings --Silver plated/Antique Gold/Antiqued Silver. 1319. jLiz4U Jewelry. Swarovski Rivoli Crystals on posts and Ultra Pink AB Cushions on a Silver plated setting/fishhook Earwires. 1320. jLiz4U Jewelry. Swarovski Peridot Rivoli with Antiqued Gold Setting and 14KGold-filled earwires, Crystal Rivoli with crystal accented Silver plated Setting and Sterling earwires, Light Silk Crystal Rivoli with crystal accented Gold plated Setting and 14KGold-filled Earwires, Volcano Crystal Rivoli with Silver plated Setting and Sterling Silver Earwires. 1314-1318. jLiz4U Jewelry . Swarovski Crystal Earrings: Swarovski square Cushions & Swarovski Round Rivoli Crystals with Stainless Steel Leverback Earwires or Silver plated Brass fishhook Earwires. 1314. jLiz4U Jewelry. Swarovski Light Sapphire Shimmer, Silver Patina , Tanzanite Cushion Crystal Leverbacks. 1315. jLiz4U Jewelry. Swarovski Lt. Turquoise cushions, Ultra Green Rivoli, Rose Rivoli Crystal Leverbacks. 1316. jLiz4U Jewelry. Swarovski Scarlet Cushions, Vitrail Medium Cushion Crystal Leverbacks and Fern Green Cushion Crystals on Fishhook earwires. 1312 & 1313. jLiz4U Jewelry . Bracelets: 1312. Blue-Green faux Druzy Coin settings with Peace charm and Made with love charm, 1313. Stretch bracelets in Hemalyke/Gunmetal/ Crow and Colorful discs. I enjoy creating & selling fun, interesting, Useable pieces of Art--Handmade / Handcrafted Jewelry, Decorating Clothes, Shoes, Bags, Purses, EyeGlass/Sunglass cords and even CAR BLING. Can't find what your looking for? Special Orders, Personalizing & Shipping are always accepted. Just "Comment" below or email me at jLiz4u@yahoo.com THANKS & Have a Great Day !